Trisha has been part of a military household for 30 years of her life. Her dad is retired Air Force and she was married to an Air Force EOD Airman. It was a challenging transition to the civilian lifestyle, but she is excited for the freedom to choose when and where she will move for her next adventure. She recently made her way back to Colorado and is working on her AAS in Outdoor Leadership and Zoology. Along with joining the No Barriers team again this year, she will be guiding rock and ice climbing trips with Front Range Climbing Company. She is looking forward to being part of many more success stories and having the opportunity to create positive changes in the lives of those she guides. 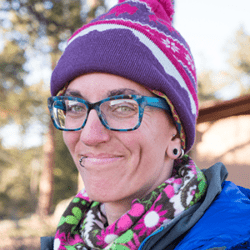 Trisha is an active volunteer in several adaptive climbing organizations and is eagerly awaiting the prospect of branching out into more of the adaptive world. In her down time she enjoys snowboarding, scuba diving and anything involving animals.